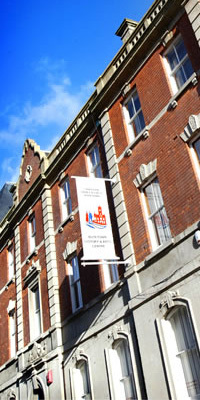 The Butetown History and Arts Centre (BHAC) is based in the culturally diverse Cardiff Bay. The BHAC was founded in 1987 and its work is concerned with promoting people’s histories of the area. The BHAC collects, preserves, copies and utilises oral histories, old photographs and other documents as well as organising community education courses and working with schools and community groups. The BHAC archive contains informal family pictures, photo’s of homes and jobs, and formal studio portraits. The collection has grown through donations of material concerning local industries, shipping firms and companies who made their fortunes in Butetown and the docks of Cardiff. The BHAC aims to create a Bays People Archive through collecting and cataloguing old photographs, audio taped recollections from Butetown’s older residents, and also artefacts such as seamen’s discharge papers, passports, immigration cards, ration books and boarding house ledgers. The Butetown History and Arts Centre is open Tuesday to Friday 10:00-5:00, while on weekends and bank holidays it’s open between 11:00-4:30.